The word "curry" has three different meanings. It can refer to a spice or spice mixture called "curry powder," the actual curry leaf, or it may refer to the dish "curry" that is cooked across many cultures and parts of the world. Curry (the dish) usually includes the curry spice mixture, or those spices used to make up the mixture. Because of the use of the same word for three different things, there can be a lot of confusion regarding curry. But once it is all explained and understood, you will not have any problem shopping, ordering, or cooking curry. The word curry comes from the word "Kari'" in the Tamil language in India, so it is believed curry originated there. Interestingly, there is also evidence that English cooks were making curry as early as the late 1300s during the reign of Richard II. Certainly, Christopher Columbus inadvertently helped the spread and development of curry through trade with the East; he not only brought curry to other countries, but he also transported chilies from the West to India which were then incorporated into the dish. Before Columbus came to India, curry was not the intensely spicy dish we recognize today. The same is true of Thai curries, which were originally seasoned with black and white peppercorns instead of chilies. Nowadays, chilies are grown around the world and have become an essential part of the dish known as curry. The dish known as curry is now so varied and widespread across the globe that its definition must remain very open to include numerous cuisines and cooking styles. Today, curry simply means any dish which has a richly spiced sauce cooked with meat and/or vegetables. It is usually eaten with rice but may also be accompanied by bread, usually flat-breads, like roti or naan. Curry is made in many countries around the world, including India, Thailand, Malaysia, Indonesia, Sri Lanka, and England just to name a few. Curries can be dry or wet. Dry curries are cooked with little liquid, resulting in a dish where the ingredients are coated in the spice mixture. Wet curries often include yogurt, coconut milk, or cream (among other ingredients), creating a sauce or gravy. There are many types of curries featuring many types of ingredients, from meat to chicken to fish to vegetables. And the color and flavor depend on from where the curry comes, as well as what type of spices are in the recipe. Thai yellow curry, for example, includes yellow chili peppers. 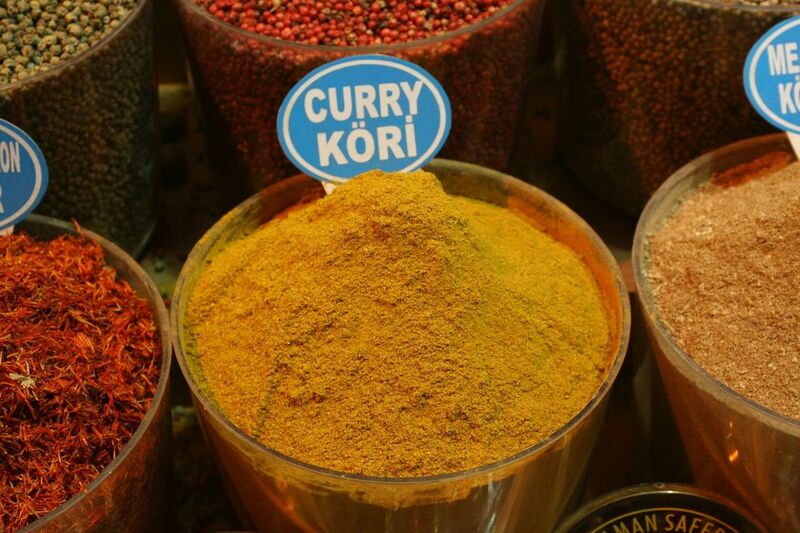 Curry is a common spice with a golden-yellow coloring sold in most supermarket spice aisles. It is used to make a variety of curry-flavored dishes. Although it looks and sounds like just one spice, curry is actually a mixture of various eastern/Asian spices, including coriander, cumin, turmeric, ginger, cloves, and others. To complicate matters further, there is also a curry plant that produces curry leaves which smell and taste like curry. This leaf is used in India in various curries and other dishes; however, please note that you do not need to use this spice to create good curry. In fact, most curries do not call for curry leaf, and when asked, the majority of good curry cooks in the world would not use—or possibly not even know of—this spice. Because of the many different fresh and dried spices, it contains, curry (the spice and the dish) can be extremely good for you. Turmeric, cumin, and coriander—the three main ingredients of most curries—are known to be anti-inflammatory and natural cleansing agents that strengthen and detoxify our bodies. When it comes to curry the dish, depending on how it is made, there can be two negatives: it may contain a lot of fat (how much depends on the cook), and it can contain large amounts of sodium. If you follow a good recipe at home, however, you can ensure these two components remain in balance with your dietary concerns and goals.